vSphere Archives - VIRTUALIZATION IS LIFE! 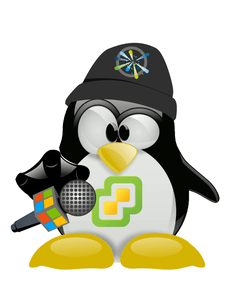 Late last week VMware released vSphere 6.5 Update 1 which included updated builds of both vCenter and ESXi and as per usual I will go through some of the key features and fixes that are included in the latest versions of vCenter and ESXi. When looking through the release notes I generally keep an eye out for improvements that relate back to Service Providers who use vSphere as the foundation of their Managed or Infrastructure as a Service offerings. This update also contains an update to vSAN which is now at 6.6.1 so I’ll spend some time looking at what’s been added there. Without question this is a significant patch release for vCenter and ESXi and the length of the release notes is testament to that point. In terms of new features there isn’t anything groundbreaking but there are a few nice additions like being able to run the VCSA GUI and CLI installers on Windows 2012 and 2012 R2 as well as 2016 and macOS Sierra and Ubuntu 17.04 OS is supported for Guest OS Customization. vCenter now supports Microsoft SQL Server 2014 SP2 2016 and SP1 as well as some increased configuration maximums supporting Linked Mode with 15 vCenter Instances, 5000 ESXi hosts and 50,000 powered on virtual machines. This release addresses the previous limitation in the upgrade and migration path for those running vSphere 6.0 U3 in going to vSphere 6.5. I know this will make a lot of providers happy as I know a lot that had to go to 6.0 Update 3 to address existing bug in the platform but where not yet ready or able to go to 6.5 at the time. 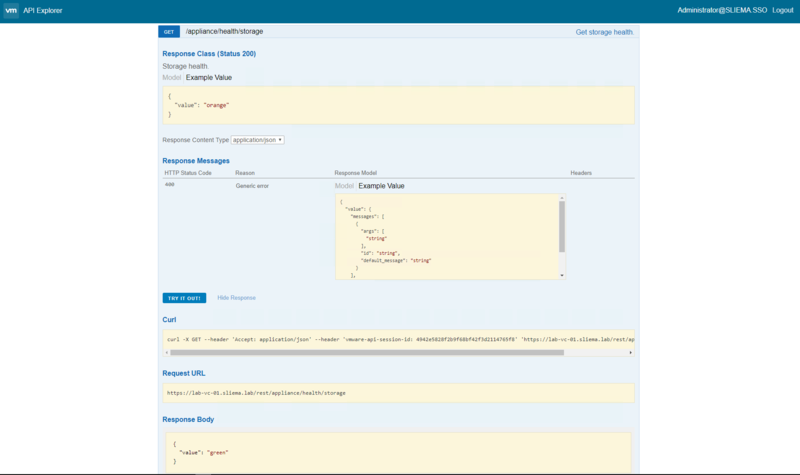 The HTML5 Web Client has gotten it’s own update that brings it up to speed with the 3.15 Fligng version however it’s still partially functional which remains somewhat frustrating…The online documentation for supported functionality has been updated to vSphere 6.5U1 and is available here. The list below is of the main updates in this release. For service providers, vSAN 6.6 was another major release that sured up vSANs status as a serious storage platform for service provider platforms. The ability to upgrade with VUM is a nice touch and continues to improve on the usability and manageability of vSAN. For a full look at what’s new in this release for vSAN 6.6.1 head to this blog post. There are a bunch of resolved issues in this release and I’ve gone through the rather extensive list to pull out the biggest fixes that relate to my experience in service provider operations and have also extended this to include fixes that relate to backup operations. The majority of what I pick out related to storage, networking hosts and VM operations…the core of any platform, but even more important in the service provider world. The ones in red are specific fixes that relate to issues that iv’e come across…good to see them addressed! Affinity rules configured on vCenter Server 5.5 can cause crashes after upgrading to vCenter Server 6.5 Migrating a VM with affinity rules configured while on vCenter Server 5.5 to a cluster that has affinity rules configured on vCenter Server 6.0 or 6.5 can cause vCenter Server to crash. VM Snapshot Size (GB) alarm is not triggered after the VM is powered on. VM Snapshot Size (GB) alarm is reset if the virtual machine is shut down. Alarm fails to trigger after the VM is powered on. This issue occurs in alarms based on VM Snapshot (GB) and Vm Total Size on Disk because their status is altered when the power state of the VM is changed. This issue occurs because disk usage of a VM is the same regardless of the VM power state. When you add ports to a vSphere Distributed Switch you get an error Because of a race condition, when you add ports to a vSphere Distributed Switch you get the error message: Cannot create a new port because number of ports exceeds 2147483647, maximum number of ports allowed on vDS. A runtime exception “Unable to retrieve data about the distributed switch” might occur while upgrading vSphere Distributed Switch (vDS) from 5.0 to 6.5 version When you try to upgrade an existing distributed switch after the vCenter upgrade is completed, the runtime exception Unable to retrieve data about the distributed switch might occur in the wizard and the distributed switch cannot be upgraded. The exception is a result of unexpected value NULL for a LACP property of the distributed switch, instead of TRUE or FALSE, as LACP is not supported for the current version of vSphere Distributed Switch. Host configuration might not be available after vCenter Server restarts After a vCenter Server restart, the host configuration might not be available if vCenter Server cannot communicate with the host. After connectivity is restored, the configuration becomes available. OVF tool fails to upload OVF or OVA files larger than 10 GB If you use OVF tool fails to upload OVF or OVA files larger than 10 GB, the upload might fail. Virtual machine crashes on ESXi 6.5 when multiple users log on to Windows Terminal Server VM Windows 2012 terminal server running VMware tools 10.1.0 on ESXi 6.5 stops responding when many users are logged in.vmware.log will show similar messages to2017-03-02T02:03:24.921Z| vmx| I125: GuestRpc: Too many RPCI vsocket channels opened. If you are using the igb native driver on an ESXi host, it always works in auto-negotiate speed and duplex mode. No matter what configuration you set up on this end of the connection, it is not applied on the ESXi side. The auto-negotiate support causes a duplex mismatch issue if a physical switch is set manually to a full-duplex mode. A Virtual Machine (VM) with e1000/e1000e vNIC might have network connectivity issues For a VM with e1000/e1000e vNIC, when the e1000/e1000e driver tells the e1000/e1000e vmkernel emulation to skip a descriptor (the transmit descriptor address and length are 0), a loss of network connectivity might occur. An ESXi host might stop responding when you migrate a virtual machine with Storage vMotion between ESXi 6.0 and ESXi 6.5 hosts The vmxnet3 device tries to access the memory of the guest OS while the guest memory preallocation is in progress during the migration of virtual machine with Storage vMotion. This results in an invalid memory access and the ESXi 6.5 host failure. When you hot-add an existing or new virtual disk to a CBT (Changed Block Tracking) enabled virtual machine (VM) residing on VVOL datastore, the guest operation system might stop responding When you hot-add an existing or new virtual disk to a CBT enabled VM residing on VVOL datastore, the guest operation system might stop responding until the hot-add process completes. The VM unresponsiveness depends on the size of the virtual disk being added. The VM automatically recovers once hot-add completes. When you use vSphere Storage vMotion, the UUID of a virtual disk might change When you use vSphere Storage vMotion on vSphere Virtual Volumes storage, the UUID of a virtual disk might change. The UUID identifies the virtual disk and a changed UUID makes the virtual disk appear as a new and different disk. The UUID is also visible to the guest OS and might cause drives to be misidentified. An ESXi host might become unresponsive if the VMFS-6 volume has no space for the journal When opening a VMFS-6 volume, it allocates a journal block. Upon successful allocation, a background thread is started. If there is no space on the volume for the journal, it is opened in read-only mode and no background thread is initiated. Any intent to close the volume, results in attempts to wake up a nonexistent thread. This results in the ESXi host failure. SSD congestion might cause multiple virtual machines to become unresponsiv Depending on the workload and the number of virtual machines, diskgroups on the host might go into permanent device loss (PDL) state. This causes the diskgroups to not admit further IOs, rendering them unusable until manual intervention is performed. Unable to collect vm-support bundle from an ESXi 6.5 host Unable to collect vm-support bundle from an ESXi 6.5 host because when generating logs in ESXi 6.5 by using the vSphere Web Client, the select specific logs to export text box is blank. The options: network, storage, fault tolerance, hardware etc. are blank as well. This issue occurs because the rhttpproxy port for /cgi-bin has a value different from 8303.This issue is resolved in this release. vSphere Storage vMotion might fail with an error message if it takes more than 5 minutes The destination virtual machine of the vSphere Storage vMotion is incorrectly stopped by a periodic configuration validation for the virtual machine. 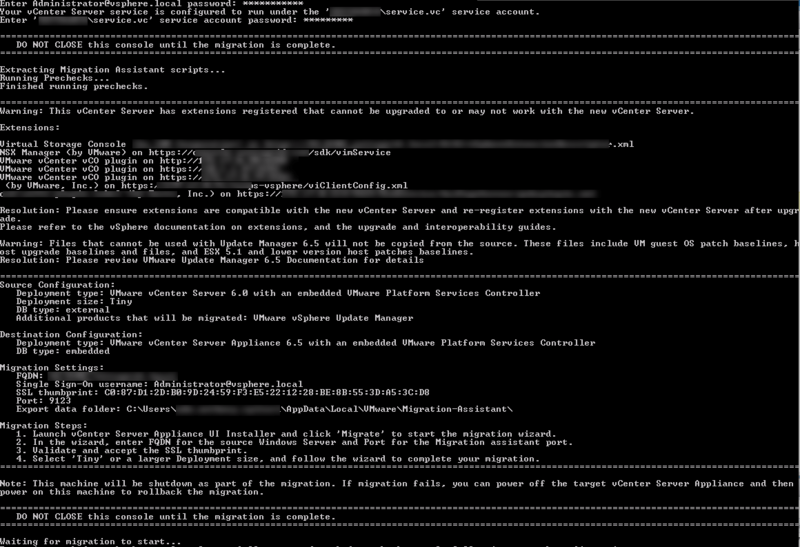 vSphere Storage vMotion that takes more than 5 minutes fails with the The source detected that the destination failed to resume message. The VMkernel log from the ESXi host contains the message D: Migration cleanup initiated, the VMX has exited unexpectedly. Check the VMX log for more details. Hosts in a vSAN cluster have high congestion which leads to host disconnects When vSAN components with invalid metadata are encountered while an ESXi host is booting, a leak of reference counts to SSD blocks can occur. If these components are removed by policy change, disk decommission, or other method, the leaked reference counts cause the next I/O to the SSD block to get stuck. The log files can build up, which causes high congestion and host disconnects. vSAN cluster becomes partitioned after the member hosts and vCenter Server reboot If the hosts in a unicast vSAN cluster and the vCenter Server are rebooted at the same time, the cluster might become partitioned. The vCenter Server does not properly handle unstable vpxd property updates during a simultaneous reboot of hosts and vCenter Server. Large File System overhead reported by the vSAN capacity monitor When deduplication and compression are enabled on a vSAN cluster, the Used Capacity Breakdown (Monitor > vSAN > Capacity) incorrectly displays the percentage of storage capacity used for file system overhead. This number does not reflect the actual capacity being used for file system activities. The display needs to correctly reflect the File System overhead for a vSAN cluster with deduplication and compression enabled. It’s also worth reading through the Known Issues section as there is a fair bit to be aware of in Update 1 and that remain from the GA.
Over the past few years i’ve written a couple of articles on upgrading vCenter from 5.5 to 6.0. Firstly an in place upgrade of the 5.5 VCSA to 6.0 and then more recently an in place upgrade of a Windows 5.5 vCenter to 6.0. This week I upgraded and migrated my NestedESXi SliemaLab vCenter using the migrate2vcsa tool that’s now bundled into the vCenter 6.5 ISO. The process worked first time and even though I held some doubts about the migration working without issue and my Windows vCenter is now in retirement. The migration tool that’s part of vSphere 6.5 was actually first released as a VMware fling after it was put forward as an idea in 2013. 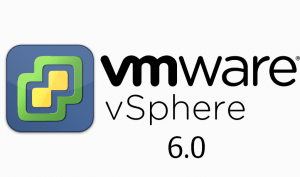 It was then officially to GA with the release of vSphere 6.0 Update 2m…where m stood for migration. Over it’s development it has been championed by William Lam who has written a number of articles on his blog and more recently Emad Younis has been the technical marketing lead on the product as it was enhanced for vSphere 6.5. My approach for this particular environment was to ensure a smooth upgrade to vSphere 6.0 Update 2 and then look to upgrade again to 6.5 once is thaws outs in the market. The cautious approach will still be undertaken by many and a stepped upgrade to 6.5 and migration to the VCSA will still be common place. 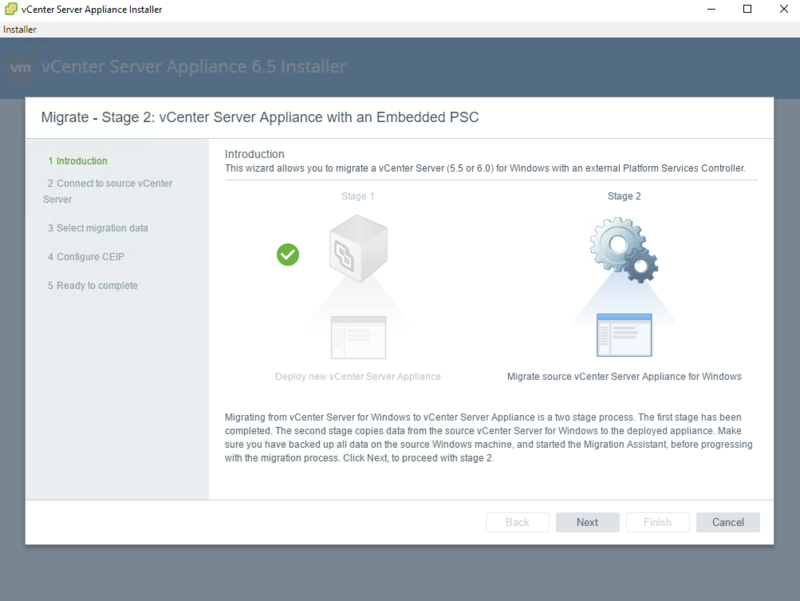 For those that wish to move away from their Windows vCenter, there is now a very reliable #migrate2vcsa path…as a side note it is possible to migrate directly from 5.5 to 6.5. 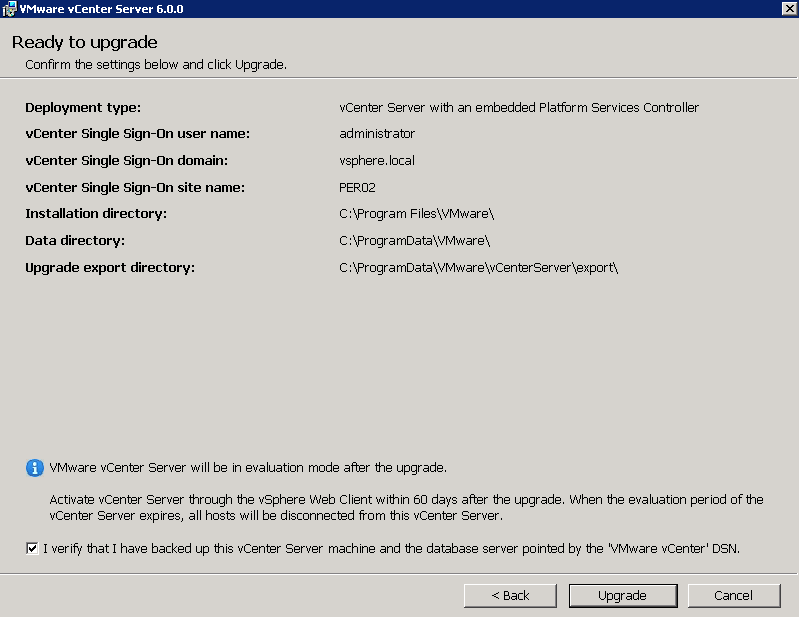 All vCenter components where installed on the Windows vCenter instance including Upgrade Manager. There where also a number of external services registered agains’t the vCenter of which the NSX Manager needed to be re-registered for the SSO to allow/trust the new SSL certificate thumbprint. This is common, and one to look out for after migration. If all checks complete successfully the migration assistant will finish at waiting for migration to start. 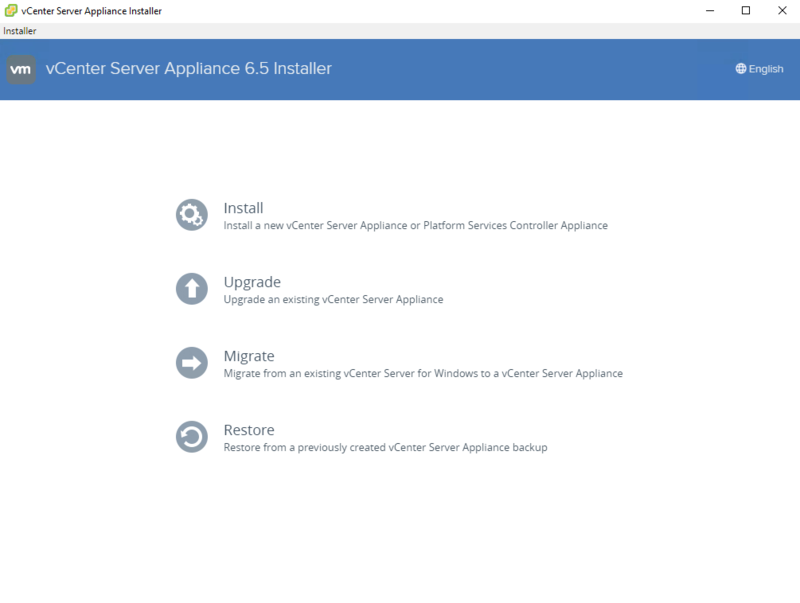 From here you start the VCSA 6.5 installer and click on the Migrate menu option. Work through the wizard which asks you for detail on the source and target servers, lets you select the compute, storage and appliance size as well as the networking settings. Once everything is entered we are ready to start Stage 1 of the process. When Stage 1 finishes you are taken to Stage 2 where is asks you to select the migration data as shown below. This will give you some idea as to how much storage you will need and what the initial foot print of the over and above the actual VCSA VM storage. There are a couple more steps the migration assistant goes through to complete the process…which for me took about 45 minutes to complete but this will vary depending on the amount of date you want to transfer across. If there are any issues or if the migration failed at any of the steps you do have the option to power down/remove the new VCSA and power back on the old Windows vCenter as is. The old Windows vCenter would have been shutdown by the migration process just as the copying of the key data finished and the VCSA was rebooted with network settings and machine name copied across. There is proper roll back series of steps listed in this VMwareKB. 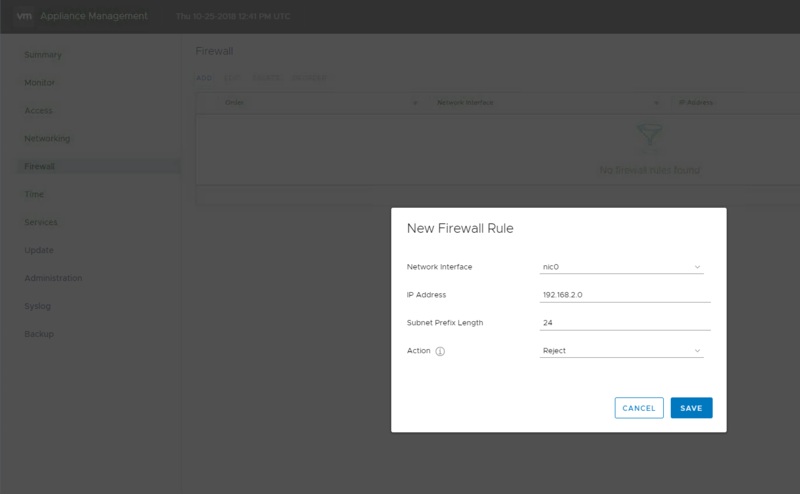 The only external service that I needed to re-register against vCenter was NSX. vCloud Director carried on without issue, but it’s worth checking out all registered services just in case. As mentioned at the start, I was a bit skeptical that this process would work as flawlessly as it did…and on it’s first time! It’s almost a little disappointing to have this as automated and hands off as it is, but it’s a testament to the engineering effort the team at VMware has done around this tool to make it a very viable and reliable way to remove dependancies on Windows and MSSQL. It also allows those with older version of Windows that are well past their used by date the ability to migrate to the VSCA with absolute confidence. 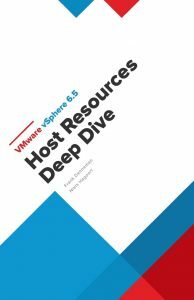 VMware vSphere 6.5 Host Resources Deep Dive – A Must Have! Just after I joined Zettagrid in June of 2013 I decided to load up vSphere 5.1 Clustering Deepdive by Duncan Epping and Frank Denneman on my iPad to read on my train journey to and from work. Reading that book allowed me to gain a deeper understanding of vSphere through the in depth content that Duncan and Frank had produced. Any VMware administrator worth their salt would be familiar with the book (or the ones that proceeded it) and it’s still a brilliant read. This time around Frank has been joined by Niels Hagoort and together they have produced another must have virtualization book…though it goes far beyond VMware virtualization. I was lucky enough to review a couple of chapters of the book and I can say without question that this book will make your brain hurt…but in a good way. It’s the deepest of deep dives and it goes beyond the previous books best practice and dives into a lot of the low level compute, storage and networking fundamentals that a lot of us have either forgotten about, never learnt or never bothered to learn about. If any of you have read Frank’s NUMA Deep Dive blog series you will start to get an appreciation of the level of technical detail this book covers, however it is written in a way that allows you absorb the information in a way that is digestible, though some parts may need to be read twice over. Well done to Frank and Niels on getting this book out and again, if you are working in and around anything to do with computers this is a must read so do yourself a favour and grab a copy. Last month I wrote a blog post on upgrading vCenter 5.5 to 6.0 Update 2 and during the course of writing that blog post I conducted a survey on which version of vSphere most people where seeing out in the wild…overwhelmingly vSphere 6.0 was the most popular version with 5.5 second and 6.5 lagging in adoption for the moment. 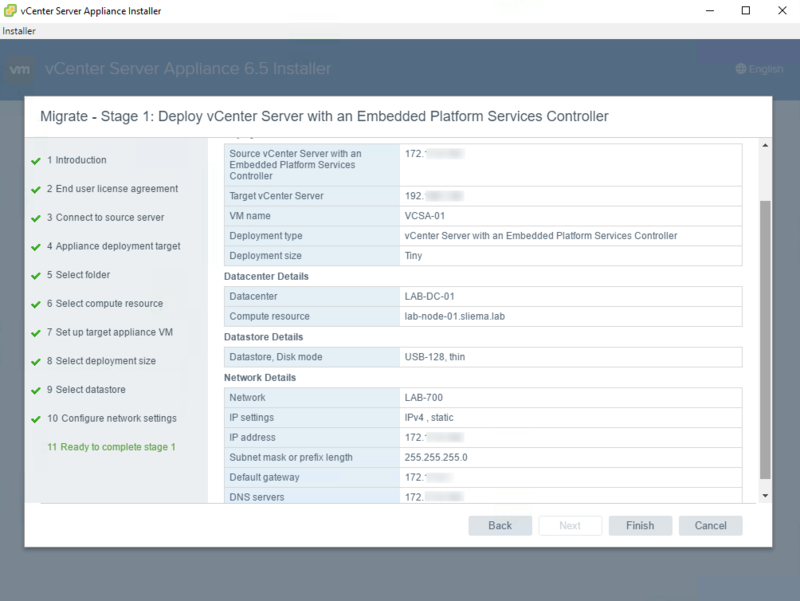 It’s safe to assume that vCenter 6.0 and ESXi 6.0 will be common deployments for some time in brownfield sites and with the release of Update 3 for vCenter and ESXi I thought it would be good to again highlight some of the best features and enhancements as I see them from a Service Provider point of view. This is actually the eighth build release of vCenter 6.0 and includes updated TLS support for v1.0 1.1 and 1.2 which is worth a look in terms of what it means for other VMware products as it could impact connectivity…I know that vCloud Director SP now expects TLSv 1.1 by default as an example. Other things listed in the What’s New include support for MSSQL 2012 SP3, updated M2VCSA support, timezone updates and some changes to the resource allocation for the platform services controller. Looking through the Resolved Issue there are a number of networking related fixes in the release plus a few annoying problems relating to vMotion. The ones below are the main ones that could impact on Service Provider operations. Attempts to upgrade vCenter Server from version 6.0.0b to 6.0.x might fail. This issue occurs while starting service An error message similar to the following is displayed in the run-updateboot-scripts.log file. The what’s new in ESXi is a lot more exciting than what’s new with vCenter highlighted by a new Host Client and fairly significant improvements in vSAN performance along with similar TLS changes that are included in the vCenter update 3. With regards to the Host Client the version is now 1.14.0. and includes bug fixes and brings it closer to the functionality provided by the vSphere Client. It’s also worth mentioning that new versions of the Host Client continue to be released through the VMware Labs Flings site. but, those versions are not officially supported and not recommended for production environments. For vSAN, multiple fixes have been introduced to optimize I/O path for improved vSAN performance in All Flash and Hybrid configurations and there is a seperate VMwareKB that address the fixes here. Checksum Improvements vSAN has several enhancements that made the checksum code path more efficient. These changes are expected to be extremely beneficial and make a significant impact on all flash configurations, as there is no additional read cache look up. These enhancements are expected to provide significant performance benefits for both sequential and random workloads. As with vCenter, I’ve gone through and picked out the most significant bug fixes as they relate to Service Providers. The first one listed below is important to think about as it should significantly reduce the number of failures that people have been seeing with ESXi installed on SD-Flash Card and not just for VDI environments as the release notes suggest. High read load of VMware Tools ISO images might cause corruption of flash media In VDI environment, the high read load of the VMware Tools images can result in corruption of the flash media. You can copy all the VMware Tools data into its own ramdisk. As a result, the data can be read from the flash media only once per boot. All other reads will go to the ramdisk. vCenter Server Agent (vpxa) accesses this data through the /vmimages directory which has symlinks that point to productLocker. When this problem occurs, the /var/log/vmkernel log file displays entries similar to the followingARP request packets might drop. ARP request packets between two VMs might be dropped if one VM is configured with guest VLAN tagging and the other VM is configured with virtual switch VLAN tagging, and VLAN offload is turned off on the VMs. When you boot a virtual machine for Citrix VDI, the physical switch is flooded with RARP packets (over 1000) which might cause network connections to drop and a momentary outage. This release provides an advanced option /Net/NetSendRARPOnPortEnablement. You need to set the value for /Net/NetSendRARPOnPortEnablementto 0 to resolve this issue. Attempts to cancel snapshot creation for a VM whose VMDKs are on Virtual Volumes datastores might result in virtual disks not getting rolled back properly and consequent data loss. This situation occurs when a VM has multiple VMDKs with the same name and these come from different Virtual Volumes datastores. 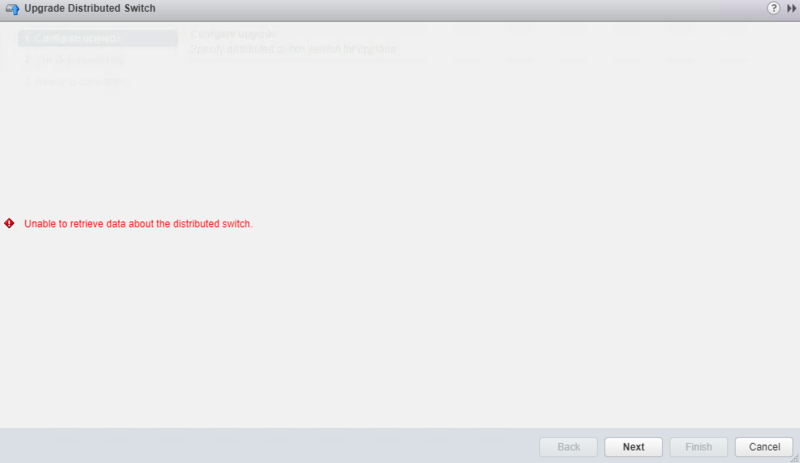 When snapshot creation attempts for a Virtual Volumes VM fail, the VMDK is tied to an incorrect data Virtual Volume. The issue occurs only when the VMDK for the Virtual Volumes VM comes from multiple Virtual Volumes datastores. An ESXi host displays a purple diagnostic screen when it encounters a device that is registered, but whose paths are claimed by a two multipath plugins, for example EMC PowerPath and the Native Multipathing Plugin (NMP). This type of conflict occurs when a plugin claim rule fails to claim the path and NMP claims the path by default. NMP tries to register the device but because the device is already registered by the other plugin, a race condition occurs and triggers an ESXi host failure. The Virtual SAN Health Service reports Virtual SAN Disk Balance warnings in the vSphere Web Client. When you click Rebalance disks, the task appears to halt at 5% for more than 24 hours. It’s also worth reading through the Known Issues section as there is a fair bit to be aware of especially if running NFS 4.1 and worth looking through the general storage issues. 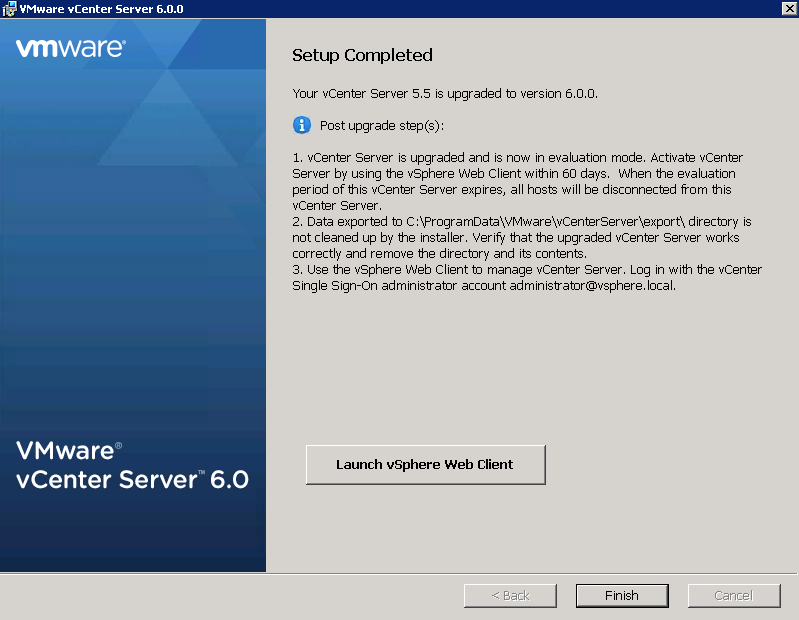 Yes that’s not a typo…this post is focusing on upgrading Windows vCenter 5.5 to 6.0 via an in-place upgrade. 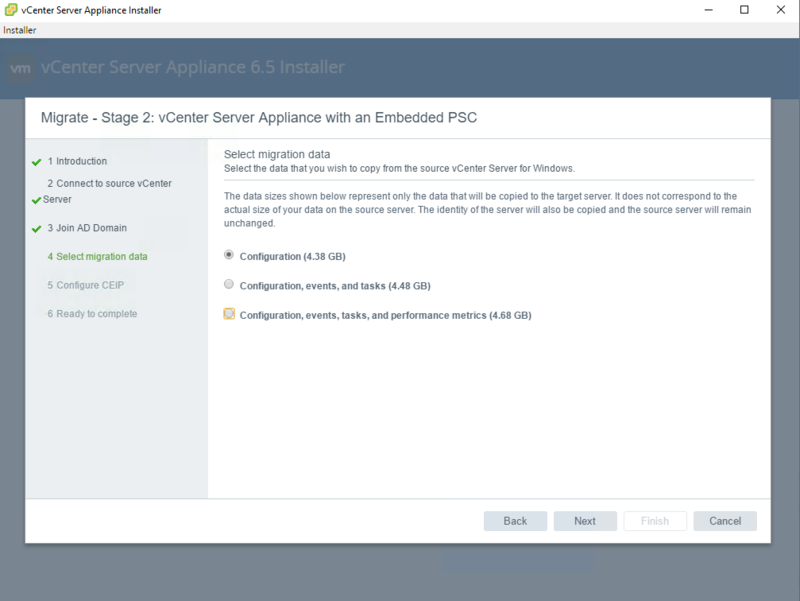 There is the option to use the vSphere 6.0 Update2M build with the included Migrate to VCSA tool to achieve this and move away from Windows, but I thought it was worth documenting my experiences with a mature vCenter that’s at version 5.5 Update 2 and upgrade that to 6.0 Update 2. Eventually this vCenter will need to move off the current Windows 2008 RTM server which will bring into play the VCSA migration however for the moment it’s going to be upgraded to 6.0 on the same server. With VMware releasing vSphere 6.5 in November there should be an increased desire for IT shops to start seriously thinking about moving on from there existing vSphere versions and upgrading to the latest 6.5 release however many people I know where still running vSphere 5.5, so the jump to 6.5 directly might not be possible due to internal policies or other business reasons. Interestingly in the rough numbers, I’ve got an active Twitter Poll out at the moment which after 100 votes shows that vSphere 5.5 makes up 53% of the most common vCenter version, followed by 6.0 with 44% and 6.5 with only 3%. My approach for this particular environment (which is a NestedESXi lab environment) was to ensure a smooth upgrade to vSphere 6.0 Update 2 and then look to upgrade again to 6.5 once is thaws outs in the market. That said, I haven’t read too many issues with vSphere 6.5 and VMware have been excellent in ensuring that the 6.5 release was the most stable for years. The cautious approach will still be undertaken by many and a stepped upgrade to 6.5 and migration to the VCSA will be common place. For those that wish to move away from their Windows vCenter, there is nothing stopping you from going down the Migrate2VCSA path, and it is possible to migrate directly from 5.5 to 6.5.
vCenter 6.0 Update 2 requires at least SQL Server 2008 R2 SP1 or higher, so if you are running anything lower than that you will need to upgrade to a later service pack or upgrade to later versions of SQL Server. For a list of all compatible databases click here. First step is to make sure you have a backup of the vCenter environment meaning VM state (Snapshot) and vCenter database backup. Once that’s done there are a few pre-requisites that need to be met and that will be checked by the upgrade process before the actual upgrade occurs. The first thing the installer will do after asking for the SSO and VC service account password is run the Pre-Upgrade Checker. 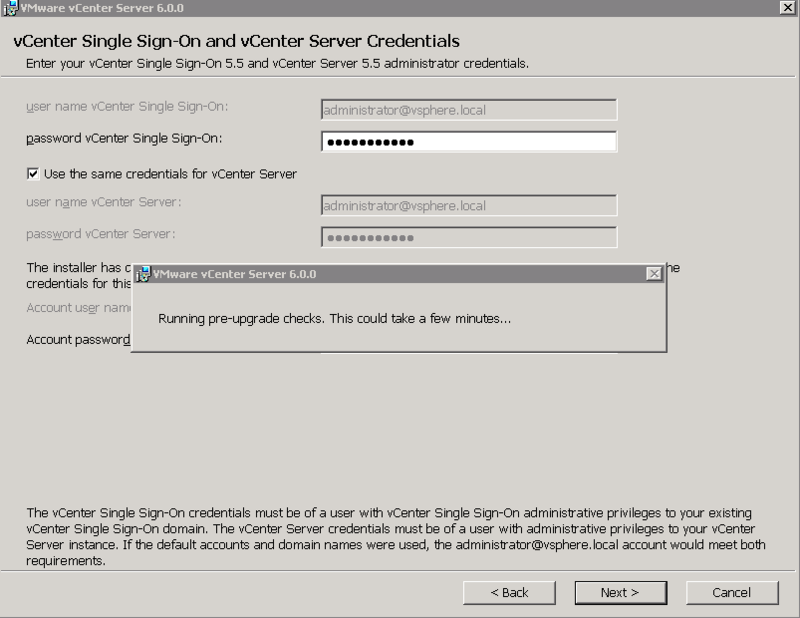 A common issue that may pop up from the pre-upgrade checker is the warning below talking about an issue with the system name of the vCenter Server certificate and the SSO certificate. As shown below it’s a hard stop and tells you to replace one or the other certificate so that the same system name is used. If you have a publicly signed SSL Certificate you will need to generate a new cert request and submit that through the public authority of choice. The quickest way to achieve this for me was to generate a new self signed certificate by following the VMwareKB article here. Once that’s been generated you can replace the existing certificate by following a previous post I did using the VMware SSL Certificate Updater Tool. After all that, in any case I got the warning below saying that the 5.5 SSL Certificates do not meet security requirements, and so new SSL certificates will need to be generated for vCenter Server 6.0.0. With that, my suggestion would be to generate a temporary self signed certificate for the upgrade and then apply a public certificate after that’s completed. Once the SSL mismatch error has been sorted you can run the pre-upgrade checker again. Once that completes successfully you move onto the Configure Ports window. 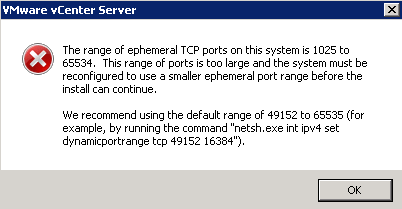 I ran into the error shown below that states that the range of port is too large and the system must be reconfigured to use a smaller ephemeral port range before the install can continue. The fix is presented in the error message so after running netsh.exe int ipv4 set dynamicportrange tcp 49152 16384 you should be ok to hit Next again and continue the upgrade. During the upgrade the 5.5 data is stored in a directory and then migrated to 6.0. You need to ensure that you have enough room on the drive location to cater for your vCenter instance. While I haven’t seen any offical rules around the storage required, I would suggest having enough storage free and the size of your vCenter SQL database data file. Once you have worked through all the upgrade screens you are ready for upgrade. Confirm the settings, take note of the fact that once updated the vCenter will be in evaluation mode, meaning you need to apply a new vCenter 6.x license once completed, check the checkbox that states you have a backup of the vCenter machine and database and you should be good to go. Depending on the size of you vCenter instance and the speed of your disks the upgrade can take anywhere from 30 to 60 minutes or longer. If at any time the upgrade process fails during the initial export of the 5.5 data a roll back via the installer is possible…however if there is an issue while 6.0 is being installed the likelihood is that you will need to recover from backups. Apart from making sure that the upgrade has gone through smoothly by ensuring all core vCenter services are up and running, it’s important to check any VMware or third party services that where registered against the vCenter especially given that the SSL Certificate has been replaced a couple of times. Server applications like NSX-v, vCloud Director and vCO explicitly trust SSL certificates so the registration needs to be actioned again. Also if you are running Veeam Backup & Replication you will need to go through the setup process again to accept the new SSL Certificate otherwise your backup jobs will fail. If everything has gone as expected you will have a functional vCenter 6.0 Update 2 instance and planning can now take place for the 6.5 upgrade and in my case…the migration from Windows to the VCSA.